Publisher: SEGA. Developer: SEGA Studios Australia. One of the most prominent trends in recent memory is remaking old games. 2013, in particular, has seen dozens of remakes. From Flashback to Speedball, classic games of yesteryear are getting updated, ranging from extremely good to mediocre. Now, SEGA’s classic Castle of Illusion is getting a full remake for downloadable platforms. Praised for its magical whimsy and incredible production values back in the day, SEGA Australia looks to present much of the same magic to a new audience. Mickey’s journey is filled with charm and fun, but is also criminally short. The story remains almost identical to the original, as Mickey attempts to rescue Minnie from Mizrabel, a witch who wants to absorb Minnie’s beauty for her own gain. The main difference is the inclusion of fully-voiced dialogue, in comparison to text and scrolling cut-scenes of the Mega Drive original. This is good, and another bright spot is the added narration, laced throughout the game, which makes the whole thing feel like a story being read to you before bedtime. The story is pretty thin to be fair, but it still manages to ooze with whimsy and charm. The story isn’t the only part which is very similar to the original. All of the original levels are fully intact and rendered in 3D for the remake. A hub structures all the levels together, with each world is divided into three acts. Two are your standard platforming, while the third contains a boss fight. A majority of this remake is faithfully recreated from the original: moments you remember, such as a topsy-turvy world which can be flipped to disillusion enemies or a pursuit with a giant apple, remain in the remake. Smartly, SEGA Australia opens up elements of exploration, as certain sections are changed into optional dreamscape worlds, making these transitions more natural. The good news is that Castle of Illusion is still a smooth platformer for the most part, if not as varied and fresh as other recent platformers. During 2D platforming, the controls work well and jumping remains fluid. The deliberate pacing contributes to this, as rather than overwhelm with enemies, Illusion favours minimal encounters and exploration. That being said, Mickey must still combat enemies, whom can be eliminated with a jump attack or by throwing objects at them. A special jump can be performed after jumping on enemies, allowing you to reach higher places and find extra secrets. Unfortunately, some troublesome 3D sections also make an appearance. The static camera and controls simply don’t work as well during these moments. One 3D-plane boss fight, in particular, is really irritating. Castle of Illusion soars particularly in its production, however. Disney’s power of imagination shines through majestically here, as the storybook cut-scenes and level rendering are great. It really is impressive how beautiful this once 16-bit game has become, as it has been brought to life in 3D with vibrant colours and good detail. Each world feels diverse, as you explore a scrumptious candy world, jump through a Toyland with nutty jack-in-the-boxes, or work your way through a forest with leaves bigger than your hand. The music is also intensely good, capturing the essence of the original soundtrack while cleaning it up and adding some extra bass to it. It feels like a glove on a hand, and the game’s presentation is intensely charming. So with all that, Castle of Illusion should be a top calibre platformer, right? But, and this is a big but, one sore issue ultimately makes it more difficult to recommendable. Much like the original, Castle of Illusion feels really breezy. 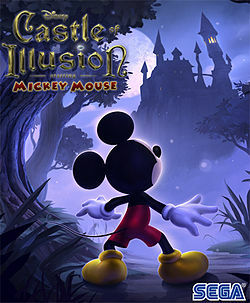 Each of the game’s levels can be completed in a good five minutes, and as such you could be done with Castle of Illusion within an afternoon. Collectibles – 800 diamonds, several statues and other collectibles which unlock costumes – do extend the replay value somewhat, but even then you will still probably finish the game the day you start it. Time attacks encourage a second run, but when you place an emphasis on speeding through the game, it doesn’t exactly extend the game much more. So, it seems that SEGA’s remake is a case of “short but sweet”. Most of the platforming is smooth and enjoyable, if not entirely original, and the atmosphere and presentation is top-notch. But ultimately, there’s so little of it to go around that it leaves you wanting a lot more. Though to be fair, a £9.99 price point is a lot fairer than paying full price, and those who aren’t put off by the lack of content will still find joy in the sheer whimsy of the adventure. It’s also one of the more faithful remakes to come out this year, though that perhaps is also Castle of Illusion’s weakness. It ultimately feels like a throwback adventure, and while it won’t compete with the insane variety of Rayman Legends, it’s still fun in its own right.